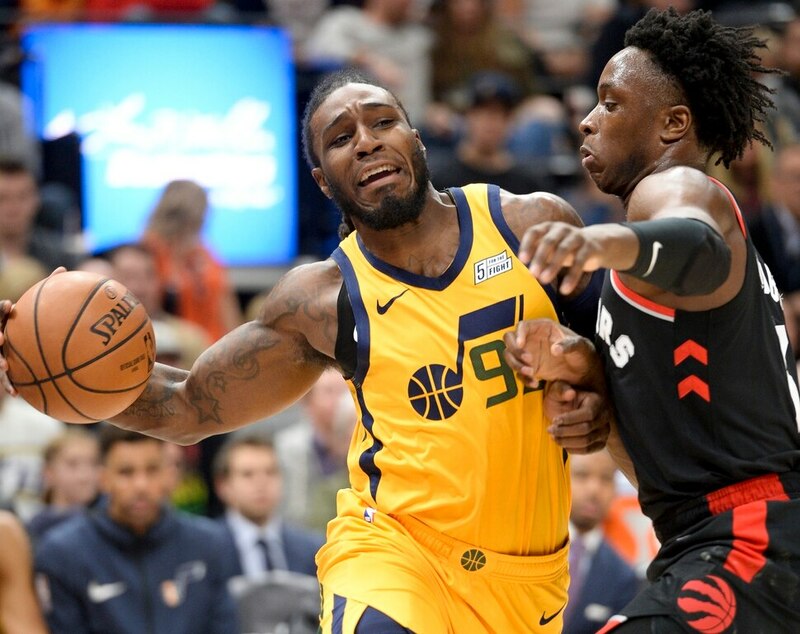 Leah Hogsten | The Salt Lake Tribune Utah Jazz forward Jae Crowder (99) battles Toronto Raptors forward OG Anunoby (3) as the Utah Jazz host the Toronto Raptors, Monday, Nov. 5, 2018 at Vivint Smart Home Arena. 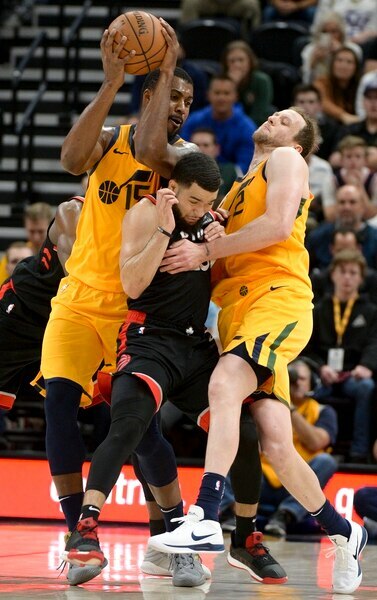 Leah Hogsten | The Salt Lake Tribune Toronto Raptors guard Fred VanVleet (23) is sandwiched between Utah Jazz forward Joe Ingles (2) and Utah Jazz forward Derrick Favors (15) as the Utah Jazz lose to the Toronto Raptors, 111-124, Monday, Nov. 5, 2018 at Vivint Smart Home Arena. Leah Hogsten | The Salt Lake Tribune Utah Jazz forward Derrick Favors (15) pulls in the rebound as the Utah Jazz host the Toronto Raptors, Monday, Nov. 5, 2018 at Vivint Smart Home Arena. Leah Hogsten | The Salt Lake Tribune Utah Jazz forward Jae Crowder (99) fights Toronto Raptors forward CJ Miles (0) to get to the net as the Utah Jazz host the Toronto Raptors, Monday, Nov. 5, 2018 at Vivint Smart Home Arena. Leah Hogsten | The Salt Lake Tribune Utah Jazz forward Joe Ingles (2) hits the deck trying to stay with Toronto Raptors forward CJ Miles (0) in the second half as the Utah Jazz lose to the Toronto Raptors, 111-124, Monday, Nov. 5, 2018 at Vivint Smart Home Arena. Leah Hogsten | The Salt Lake Tribune Toronto Raptors forward CJ Miles (0) fouls Utah Jazz forward Jae Crowder (99) as the Utah Jazz host the Toronto Raptors, Monday, Nov. 5, 2018 at Vivint Smart Home Arena. Leah Hogsten | The Salt Lake Tribune Utah Jazz guard Ricky Rubio (3) tries to stick with Toronto Raptors guard Delon Wright (55) as the Utah Jazz lose to the Toronto Raptors, 111-124, Monday, Nov. 5, 2018 at Vivint Smart Home Arena. Leah Hogsten | The Salt Lake Tribune Toronto Raptors guard Kyle Lowry (7) tries to steal from Utah Jazz guard Alec Burks (10)as the Utah Jazz host the Toronto Raptors, Monday, Nov. 5, 2018 at Vivint Smart Home Arena. Leah Hogsten | The Salt Lake Tribune Utah Jazz forward Joe Ingles (2) battles Toronto Raptors forward CJ Miles (0) for the rebound as the Utah Jazz host the Toronto Raptors, Monday, Nov. 5, 2018 at Vivint Smart Home Arena. Leah Hogsten | The Salt Lake Tribune Utah Jazz forward Royce O'Neale (23) for two as the Utah Jazz host the Toronto Raptors, Monday, Nov. 5, 2018 at Vivint Smart Home Arena. Leah Hogsten | The Salt Lake Tribune Utah Jazz guard Ricky Rubio (3) looks for the pass as the Utah Jazz host the Toronto Raptors, Monday, Nov. 5, 2018 at Vivint Smart Home Arena. Leah Hogsten | The Salt Lake Tribune Utah Jazz guard Dante Exum (11) is blocked by Toronto Raptors forward Serge Ibaka (9) trying to stay with Toronto Raptors forward Chris Boucher (25) as the Utah Jazz host the Toronto Raptors, Monday, Nov. 5, 2018 at Vivint Smart Home Arena. Leah Hogsten | The Salt Lake Tribune Utah Jazz guard Alec Burks (10) hits the net as the Utah Jazz host the Toronto Raptors, Monday, Nov. 5, 2018 at Vivint Smart Home Arena. Leah Hogsten | The Salt Lake Tribune Utah Jazz forward Joe Ingles (2) pulls in the loose ball before Toronto Raptors guard Kyle Lowry (7) as the Utah Jazz host the Toronto Raptors, Monday, Nov. 5, 2018 at Vivint Smart Home Arena. Leah Hogsten | The Salt Lake Tribune Utah Jazz guard Dante Exum (11) for two as the Utah Jazz host the Toronto Raptors, Monday, Nov. 5, 2018 at Vivint Smart Home Arena. Leah Hogsten | The Salt Lake Tribune Utah Jazz center Ekpe Udoh (33) celebrates play as the Utah Jazz host the Toronto Raptors, Monday, Nov. 5, 2018 at Vivint Smart Home Arena. Leah Hogsten | The Salt Lake Tribune Utah Jazz forward Joe Ingles (2) battles Toronto Raptors forward CJ Miles (0) and Toronto Raptors forward Pascal Siakam (43) the Utah Jazz host the Toronto Raptors, Monday, Nov. 5, 2018 at Vivint Smart Home Arena. Leah Hogsten | The Salt Lake Tribune Utah Jazz guard Alec Burks (10) hits the net as the Utah Jazz host the Toronto Raptors, Monday, Nov. 5, 2018 at Vivint Smart Home Arena. Leah Hogsten | The Salt Lake Tribune Utah Jazz forward Royce O'Neale (23) tries to stop Toronto Raptors guard Fred VanVleet (23)as the Utah Jazz host the Toronto Raptors, Monday, Nov. 5, 2018 at Vivint Smart Home Arena. Leah Hogsten | The Salt Lake Tribune Utah Jazz forward Joe Ingles (2) pressures Toronto Raptors guard Danny Green (14) as the Utah Jazz host the Toronto Raptors, Monday, Nov. 5, 2018 at Vivint Smart Home Arena. Leah Hogsten | The Salt Lake Tribune Toronto Raptors guard Fred VanVleet (23) shoots around Utah Jazz center Rudy Gobert (27) as the Utah Jazz host the Toronto Raptors, Monday, Nov. 5, 2018 at Vivint Smart Home Arena. 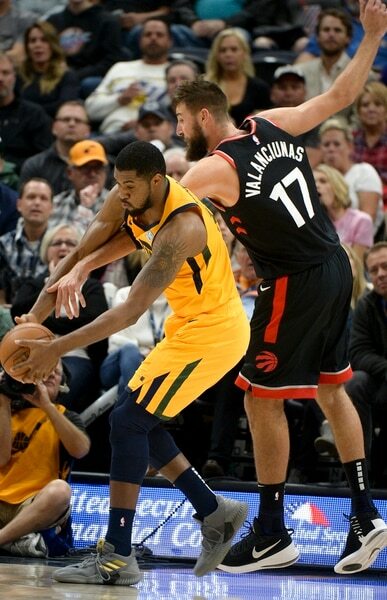 Leah Hogsten | The Salt Lake Tribune Utah Jazz forward Royce O'Neale (23) gets the ball knocked out of his hands by Toronto Raptors center Jonas Valanciunas (17) as the Utah Jazz host the Toronto Raptors, Monday, Nov. 5, 2018 at Vivint Smart Home Arena. Leah Hogsten | The Salt Lake Tribune Toronto Raptors forward Pascal Siakam (43) and Toronto Raptors forward OG Anunoby (3) guard Utah Jazz center Rudy Gobert (27) under the net as the Utah Jazz host the Toronto Raptors, Monday, Nov. 5, 2018 at Vivint Smart Home Arena. Leah Hogsten | The Salt Lake Tribune Utah Jazz guard Ricky Rubio (3) hits the deck with Toronto Raptors center Jonas Valanciunas (17) trying to get the rebound as the Utah Jazz host the Toronto Raptors, Monday, Nov. 5, 2018 at Vivint Smart Home Arena. Leah Hogsten | The Salt Lake Tribune Utah Jazz forward Derrick Favors (15) grabs the rebound over Toronto Raptors center Greg Monroe (15) as the Utah Jazz host the Toronto Raptors, Monday, Nov. 5, 2018 at Vivint Smart Home Arena. Leah Hogsten | The Salt Lake Tribune Utah Jazz center Rudy Gobert (27) pressures Toronto Raptors center Jonas Valanciunas (17)as the Utah Jazz host the Toronto Raptors, Monday, Nov. 5, 2018 at Vivint Smart Home Arena. Leah Hogsten | The Salt Lake Tribune Utah Jazz center Rudy Gobert (27) battles Toronto Raptors center Greg Monroe (15) under the net as the Utah Jazz lose to the Toronto Raptors, 111-124, Monday, Nov. 5, 2018 at Vivint Smart Home Arena. Leah Hogsten | The Salt Lake Tribune The Utah Jazz lost to the Toronto Raptors, 111-124, Monday, Nov. 5, 2018 at Vivint Smart Home Arena. Leah Hogsten | The Salt Lake Tribune Utah Jazz guard Ricky Rubio (3) reacts to play as the Utah Jazz host the Toronto Raptors, Monday, Nov. 5, 2018 at Vivint Smart Home Arena. Leah Hogsten | The Salt Lake Tribune Toronto Raptors forward OG Anunoby (3) hits the net between Utah Jazz center Ekpe Udoh (33) and Utah Jazz forward Thabo Sefolosha (22) as the Utah Jazz lose to the Toronto Raptors, 111-124, Monday, Nov. 5, 2018 at Vivint Smart Home Arena. Leah Hogsten | The Salt Lake Tribune Toronto Raptors guard Delon Wright (55) hits the net as the Utah Jazz lose to the Toronto Raptors, 111-124, Monday, Nov. 5, 2018 at Vivint Smart Home Arena. Leah Hogsten | The Salt Lake Tribune Utah Jazz guard Alec Burks (10) loses the rebound to Toronto Raptors center Greg Monroe (15) in the second half as the Utah Jazz lose to the Toronto Raptors, 111-124, Monday, Nov. 5, 2018 at Vivint Smart Home Arena. Leah Hogsten | The Salt Lake Tribune Utah Jazz guard Alec Burks (10) gets his hand wrapped in ice after coming off the court as the Utah Jazz lose to the Toronto Raptors, 111-124, Monday, Nov. 5, 2018 at Vivint Smart Home Arena. Leah Hogsten | The Salt Lake Tribune Utah Jazz guard Donovan Mitchell (45) watches the game from the sidelines as the Utah Jazz host the Toronto Raptors, Monday, Nov. 5, 2018 at Vivint Smart Home Arena. Leah Hogsten | The Salt Lake Tribune Utah Jazz coach Quin Snyder regroups with his coaching staff during the Utah Jazz loss to the Toronto Raptors, 111-124, Monday, Nov. 5, 2018 at Vivint Smart Home Arena. At what point do troubling concerns become troubling trends? Donovan Mitchell suggested after the loss in Denver on Saturday that Game 9 of the season was too early to panic about the Jazz’s lackluster defense, but that they couldn’t have that same attitude by Game 20. Perhaps Game 10 should be the wake-up call, considering it saw Utah allow a Toronto team missing Kawhi Leonard to shoot 57 percent from the floor en route to a 124-111 victory on Monday night at Vivint Smart Home Arena. The loss was the Jazz’s fourth in a row, and dropped the team to 0-4 at home this season and 4-6 overall. It seemed to spark a sense of urgency from some of the players afterward. It looked initially as though this might the game the team broke out of its defensive funk, forcing the Raptors into a turnover on each of their first three possessions and racking up four steals in the game’s opening minutes. But, as has been the trend for much of this season, a leaky defense that simply allows the opponent too many wide-open looks undid the solid start. Toronto committed seven turnovers in the first quarter, but trailed by only one point by virtue of shooting 68.4 percent from the field. And while Toronto couldn’t quite maintain that kind of pace, the Jazz simply couldn’t keep up at all. Rudy Gobert got an earful from Snyder after failing to challenge a Jonas Valanciunas 3-pointer. The reigning Defensive Player of the Year was later subbed out after failing to challenge Serge Ibaka on a short floater in the lane. His teammates weren’t having much more success getting stops. Toronto’s lead was 11 by halftime (thanks to 63.4 percent shooting) and 22 by the end of the third (with its field-goal percentage down to a positively mortal 61.9). Meanwhile, the Jazz continued to have issues on the other end of the floor, too. The team has shown itself capable of scoring points — even with Mitchell sitting out Monday with a sprained ankle — but continues to leave many more out there. Utah’s outside shooting touch remains inexplicably absent (the team was 1 for 6 from deep after the first quarter, 1 for 12 at halftime, 2 for 17 after three, and 8 for 31 overall — 25.8 percent — after a relatively hot fourth quarter and the game out of hand. The Jazz also failed to properly capitalize on their huge free-throw advantage. Toronto didn’t even get its first freebie until 20 minutes of action had passed, and Utah went into the break with a 21-5 margin in attempts. However, they converted only 13 of them (61.9 percent). Utah finished 27 of 41 at the line for the game (65.9 percent). Still, in the end, the team knows that the biggest reason for its struggles thus far has been its inability to consistently stop other teams from scoring. That pride means that, even if frustration is setting in, there’s still a belief that things can and will get turned around. • Toronto shoots 57 percent from the field and 39.4 percent from the 3-point line in sending Utah to its fourth straight defeat and an 0-4 record at home. • Utah's struggles from the 3-point and free-throw lines continue, as they shoot just 8 of 31 (25.8 percent) from the former and 27 of 41 (65.9 percent) from the latter. • Alec Burks leads all scorers with 22 points off Utah’s bench. Serge Ibaka went 8 for 8 from the field for 17 points for Toronto.